I happened upon this picture a few minutes ago. 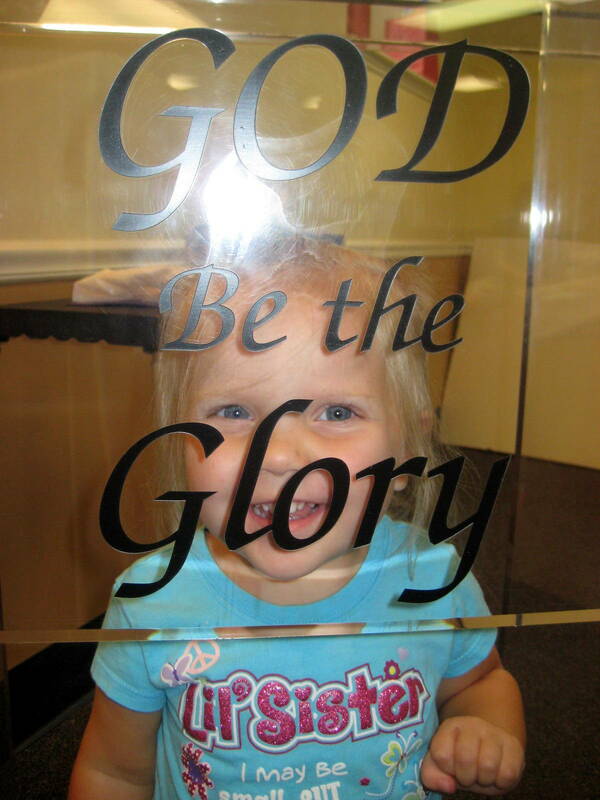 My granddaughter is having fun hiding behind a glass pulpit. I thought this photo communicated a lot with just a few words. If I were put my face here….would the words shown “‘to’ God Be the Glory” reflect my life? I pray so. I want the fruit of God’s spirit to be evident in my life so that God’s glory can be seen and He will be honored. I love the thought of seeing each of our faces in the background of this picture…reflecting God’s glory. Glory is sort of a “church word” – where meaning can get lost in familiarity. I see it most simply as the awesome (in the truest sense of the word) and consuming presence of God! Imagine with me your face behind this caption. Does it fit there? Does your expression and demeanor reflect God’s presence? How about your words…and the tone of your words? Do the choices you are making reflect the glory of God? What would your caption say? Our demeanor, words, and choices always reflect something….and could always have an accompanying caption. After reading many verses about God’s glory….and thinking about my “captions”…I am more keenly equipped to consider what and who I am reflecting as I go through my day. I’m also grateful, as the scripture below states, that God sees me as a work in progress – that I can grow and change each day. He is full of grace as well as truth, helping me in my weaknesses to become more like Jesus every day. 16 But whenever anyone turns to the Lord, the veil is taken away. 17 Now the Lord is the Spirit, and where the Spirit of the Lord is, there is freedom. 18 And we, who with unveiled faces all reflect the Lord’s glory, are being transformed into his likeness with ever-increasing glory, which comes from the Lord, who is the Spirit. 16 Whenever, though, they turn to face God as Moses did, God removes the veil and there they are—face to face! 17 They suddenly recognize that God is a living, personal presence, not a piece of chiseled stone. And when God is personally present, a living Spirit, that old, constricting legislation is recognized as obsolete. We’re free of it! 18 All of us! Nothing between us and God, our faces shining with the brightness of his face. And so we are transfigured much like the Messiah, our lives gradually becoming brighter and more beautiful as God enters our lives and we become like him. 16 but when one turns to the Lord, the veil is removed. 17 Now the Lord is the Spirit, and where the Spirit of the Lord is, there is freedom. 18 And all of us, with unveiled faces, seeing the glory of the Lord as though reflected in a mirror, are being transformed into the same image from one degree of glory to another; for this comes from the Lord, the Spirit. This entry was posted in Recent Posts, Uncategorized and tagged change, character, spiritual growth by jeanieshaw. Bookmark the permalink. I love keeping up with you through your blogs….feel like we can be discipleship partners (maybe a bit ine-sided since I am getting all the benefits of the lessons you are learning!!). Thanks for your sharing your life’s lessons with all of us!!! You are a very dear friend to me!! I always feel like we stay connected. You are such dear, forever friend to me! Thanks, Gloria.